A young woman wears a shirt bearing the logo of the 67th DPI/NGO Conference at United Nations Headquarters in New York, 22 August 2018. “DPI is proud to work closely with civil society to plan this unique event for networking and examining together how the UN and the NGO community can work together solve global problems,” said Ms. Alison Smale, Under-Secretary-General for Global Communications. The participants adopted by acclamation in the closing session an outcome document entitled ‘People Centered Multilateralism: A Call to Action,’ and which will be known by the shorthand the New York Action Plan. It contains specific civil society commitments, as well as calls for the UN Secretary-General, Member States, multinational corporations and the UN itself. “We are heartened to see how strong support is for multilateralism among civil society and how committed they are to partner in the spirit of the UN Charter,” Ms. Smale added. Youth played an integral role in planning and participating in the Conference, including with a dedicated ‘youth hub’. 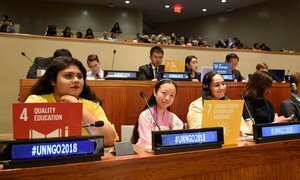 They also adopted a Youth Declaration, “We the Future,” part of the outcome document, which offers a set of visions, commitments and recommendations, drafted by and for youth. At the closing, Ms. Smale announced that next year, Utah’s Salt Lake City would host the 68th conference. from 26 to 28 August. In that same people-centred spirit, this year’s Conference re-committed to foster multilateralism dedicated both to human rights and sustainable development – with a pledge to uplift the rights of those most under threat.